I’ve been working with the fine folks at E-Merge Interactive (http://www.connectwithemerge.com/) long before they were known as E-Merge Interactive. Barry Lee, David Smith and Kerry Brown are pretty much the brain trust behind E-Merge Interactive and I have worked with all three of these individuals for more than 25 years. I used to do quite a bit of video and audio production at Smith-Lee for a variety of clients. Dave’s wife, Sandy, is an amazing composer and gifted musician who I worked with to create award-winning commercials and videos back in the day. E-merge Interactive, providing a full range of interactive services, primarily for B2B clients. 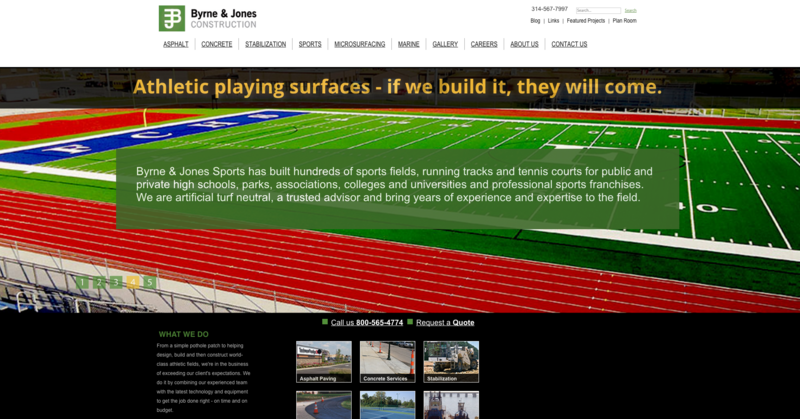 A partial look at the home page of Byrne & Jones Construction. 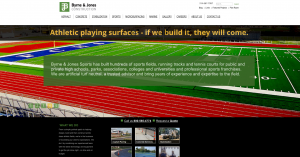 When we first began working with Byrne & Jones, their website was, to put it politely, a work in progress. Many of the sub-pages were incomplete. The home page featured rotating imagery but it didn’t really focus on key benefits of what the company provided. 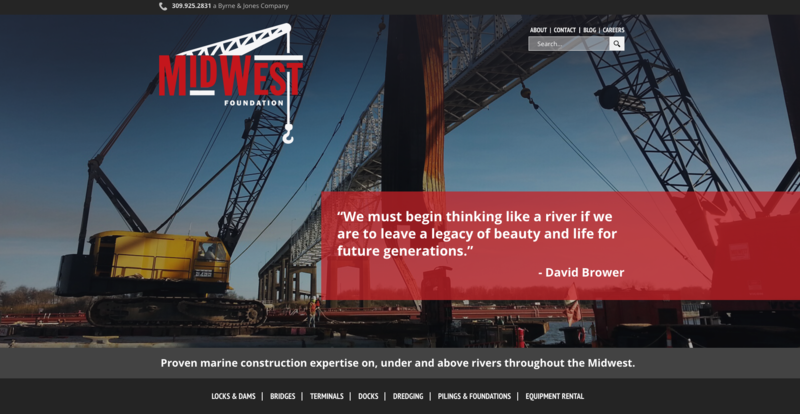 We recently launched a newly updated website for Midwest Foundation, a Byrne & Jones Company. 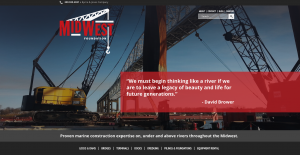 Over a period of time, we completely overhauled the website and began doing SEO work as well, partnering with Romondo Davis of Davis Interactive for his expertise in all aspects of social media. 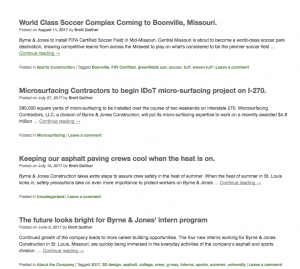 The Byrne & Jones blog, that hadn’t had any new posts for quite some time began getting regular entries which we pushed out via social media to help drive more traffic to the site. 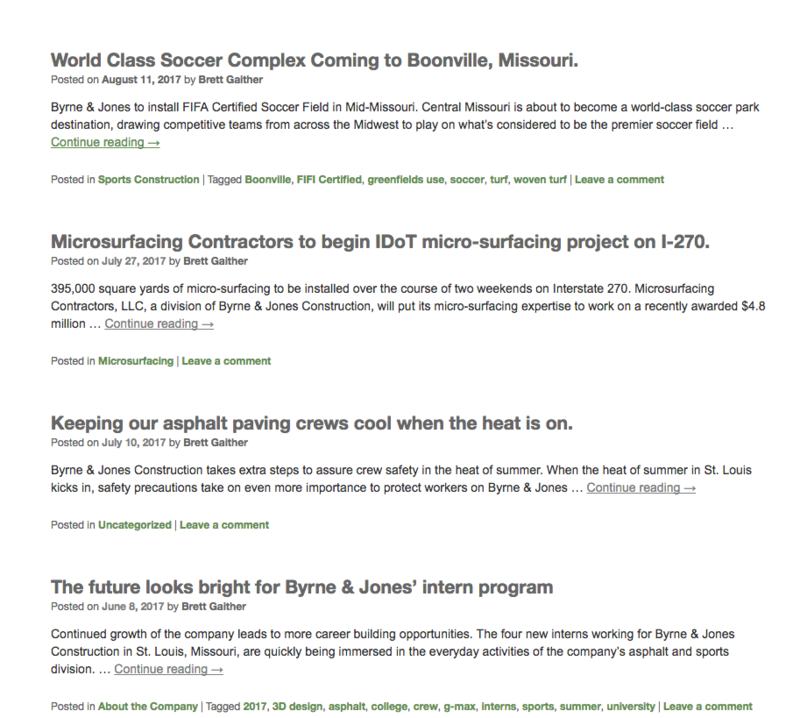 Thought leadership articles and profiles of projects are now regularly posted via the Byrne & Jones blog. Numbers have been trending upward and the growth of Byrne & Jones continues to be on the rise as well. They are a well-managed, well-run company that needed their website and social media to catch up in order to better tell their story. Byrne & Jones is just one of the clients that I have partnered with E-Merge Interactive to help provide marketing communications. We’re in the process of launching a new website for another B2B client and there are more projects in the works. It’s been a good blend of their interactive capabilities and my branding and writing expertise. The business model for BloodLines Creative is fairly flexible. I work directly for clients. I also work with agencies to help with their client needs in times of overflow or for select projects. I work with in-house agencies, helping to write or produce videos. And I partner with other designers, social media providers or production companies to assist their client needs. It all results in an ever-changing, always interesting flow of assignments. I am honored to be a part of each and every one. Now, what can I do for you? I didn’t know Alan Epstein when he was Partner of Adamson Advertising. But I did meet him back in the early days of BloodLines Creative. Alan enlisted my help, along with E-merge Interactive, to create a campaign for Maryville University – and that began a working relationship that continues to this day. 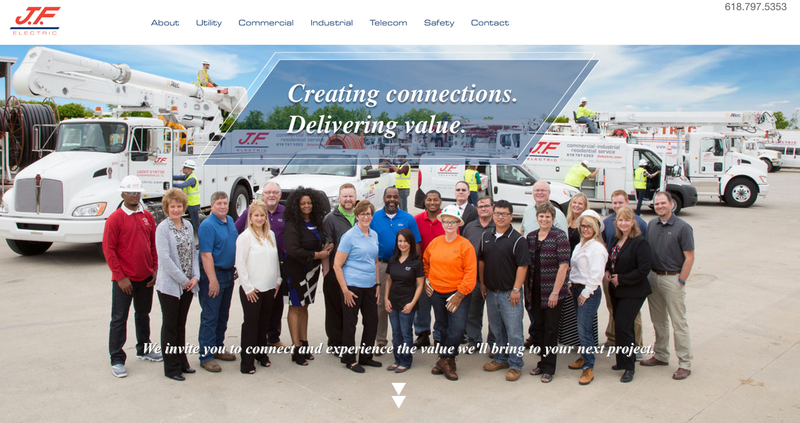 Over the past year, we have partnered together on a variety of new business pursuits and, once again working with E-merge Interactive, did some significant branding work on behalf of J.F. Electric – a large, family-owned electrical contractor located in Edwardsville, Illinois. The work done for J.F. Electric began before I got on board. Alan had helped conduct a market research strategy that identified key strengths of the company as well as a few areas in definite need of improvement. On the plus side, the company was known for their customer service and how hard they worked to find solutions to their customers electrical needs, often delivering innovative solutions that saved time, money or oftentimes, both. But the J.F. Electric brand seemed dated. Their website had been launched quite a few years ago and was never actually fully completed and the info on the site was rather nondescript. They had a theme line but it was so generic I can’t really remember what it was. The J.F. Electric logo needed a refresh as well. So we went to work. With a focused creative strategy in hand, we continued the branding process, beginning with the development of a new theme line as well as creating a new logo that wouldn’t depart too far from their scripted logo treatment to a bolder, more contemporary looking version. The script format seemed dated and some people mistook the ‘F’ for a ‘T’. The new J.F. Electric maintained the bright red and the italic flex of the font was similar to the scripted version but was also easier to read. They were in the business of creating connections – both electrical and on a personal level, too. Delivering value spoke to the added value aspect that stood out with so many of the customers that had been interviewed. Once the new logo and theme line had been approved, we developed an overall collateral look, giving them new business cards, letterhead, powerpoint templates and how the logo and tag line would look on their new website – which was also underway. With a company like J.F. 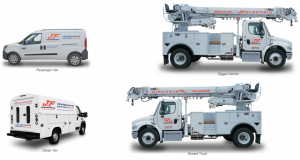 Electric, oftentimes their best form of advertising is found on the sides and backs of their vehicle fleet. So we designed vehicle graphics for pickup trucks, bucket trucks, digger derricks, vans and trailers. J.F. Electric’s fleet turns into rolling advertisements for the company. Meanwhile, work continued on the J.F. Electric website. We wanted to effectively capture the work they do in four different categories: Utilities/Commercial/Industrial and Telecom. We wanted case histories in each category and wanted to be able to tell the full story of J.F. Electric – a company whose roots go back to the 1904 World’s Fair in St. Louis. A portion of the parallax formatted home page of the J.F. Electric website. In addition to the website work, we created an extensive Brand Standards guide that can be used internally and by vendors to assure that the J.F. Electric brand is consistently delivered across all media and platforms. We also created a new employee video and helped with the development of trade show materials. 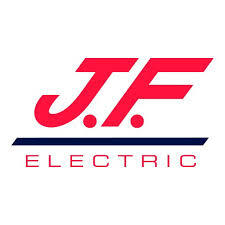 All in all, the newly refreshed J.F. Electric brand is getting noticed, remembered more and business continues to grow. And that’s what it’s all about. J.F. Electric has been an excellent client to work for and there’s more to come as Alan and I both continue to partner together to help collectively solve our client’s marketing challenges.